[By Shiho Nakaza in Los Angeles, CA USA] Los Angeles group of sketchers went to California Science Center for 50th Worldwide Sketchcrawl. The star attraction of this museum is the Space Shuttle Endeavor. The more I studied it, the more it felt like a "living" creature, snub nose and all. I liked seeing the dirt and scratches, joints and seams - it's incredible to see something that went to space 25 times and back again. It is now resting comfortably here on earth. 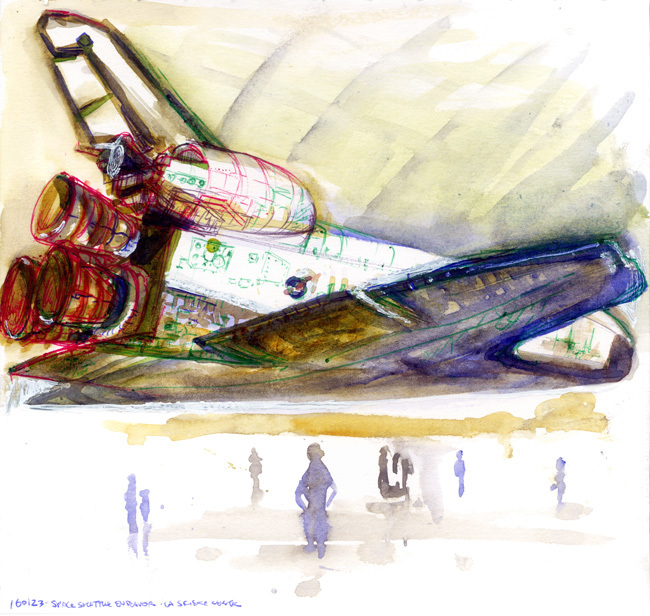 I sketched here in 2014 when the Shuttle first arrived, so I looked for more dramatic angle and focused on painting rather than drawing this time. My fellow Los Angeles correspondent and sketching buddy Virginia Hein learned that this exhibit is going to close this year for remodeling, so I feel lucky to see this view!